Microwave frozen broccoli on microwavable plate uncovered on High 4 minutes; set aside. In 10-inch skillet, heat a few teaspoons of the olive oil over medium-high heat until hot. Add chicken, salt, pepper and red pepper flakes. Cook until golden on outsides and no longer pink in center. Remove chicken to plate. Add onion to the still-hot pan; season with salt, and cook until onion begins to soften and become translucent. Add garlic; cook 60 seconds. Add 2 tablespoons of the olive oil, followed by flour, and stir to make a roux. Cook the roux 1 to 2 minutes or until lightly golden. Gradually beat in the chicken broth with whisk, followed by the milk, and simmer until slightly thickened into a gravy. Either in the skillet (if large enough), or a large mixing bowl, mix the chicken, gravy, broccoli, brown rice, and half of the cheese. Pour mixture into baking dish. In small bowl, mix bread crumbs and melted butter; add remaining cheese, and spread the mixture on top of casserole. Bake about 20 minutes or until top is crisp and golden and casserole is bubbling around edges. Let sit a few minutes before serving. Use regular brown rice (either cook it as directed on package or buy precooked); don't use quick-cooking rice-it will lose its texture in the casserole. 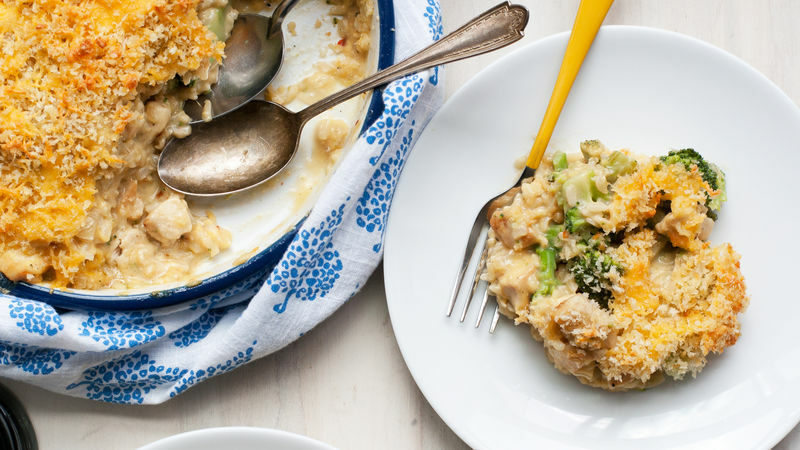 This casserole reheats nicely in the microwave or oven. To reheat in the oven, just cover the top with foil to prevent the top from burning.